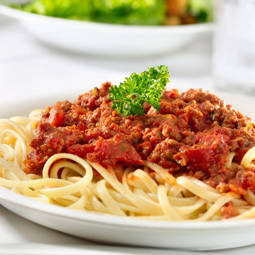 Veal Bolognese Pasta Sauce - A recipe from Savor California, the online showcase for extraordinary gourmet foods and beverages from California. Heat the olive oil and 4 Tablespoons of butter in a heavy bottomed pot. Add the minced vegetables and saute over low heat, stirring occasionally, until they are very soft and have almost melted into a puree. This can take about 30 minutes. Stir frequently to avoid burning. Add the fennel pollen and salt and saute for 2 to 3 minutes. Add to the meat. Raise the heat and continue to stir until the meat is no longer pink. Cook pasta according to package directions. Top with sauce and grated cheese.